Get Your Engineers to Record More Leads For You From The App. Our mobile leads feature is a great tool to have on our Eworks App for all sales operatives out on the field! You can manage all leads in your account, add new leads and access all information without having to use a PC! This is perfect for those of you who use telesales staff and companies that you outsource for your appointments. All your contact information is tracked and allows you to run reports based on how your sales team are performing, how much profit is coming in and track if you are losing money. With our report feature, nothing will slip through the net! Leads can easily be converted into an estimate or an appointment for your sales force to go and quote for the work. Having the ability to assign leads to different sales staff makes managing your leads easy and effectively and have a balanced workforce. You can see who is performing well within your company and who may need to get a bit more training guidance to boost those sales figures! With user security, you can manage who can have access to leads, which will be for both the admin and mobile, so you are in control and your company data is safe and in the right hands. Managers can reassign leads to other users to reignite lost interests and hopefully get them back on target. 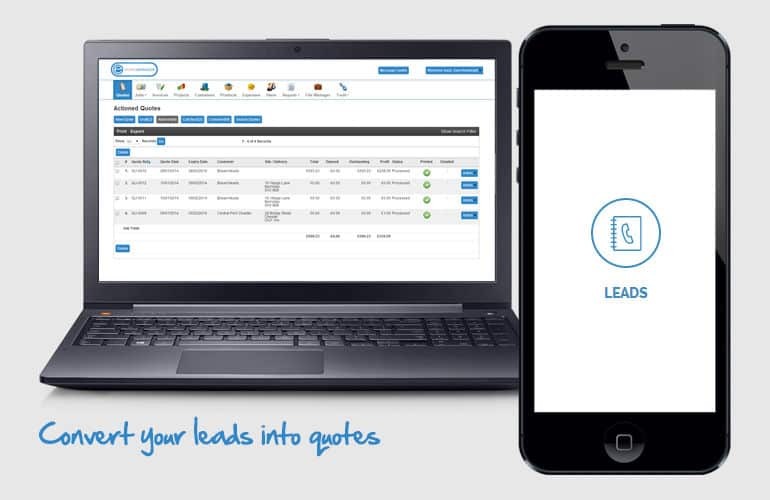 Record new leads, convert leads into a quote or customer, all on out mobile leads feature!